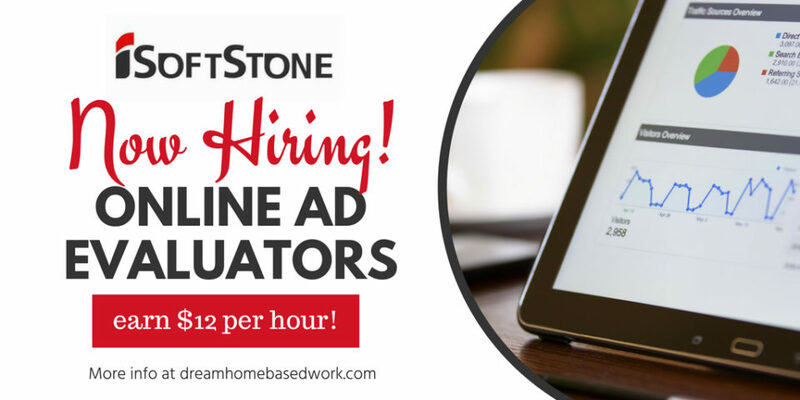 iSoftStone is a global company that hires home-based Ad Evaluators in the U.S. This company was founded in China, and is one of the fastest growing technology providers, servicing clients worldwide. If you are looking for a non-phone job and consider yourself internet-savvy, then this could be a good work at home opportunity for you. What is the Pay and Hours? The starting pay is $12 per hour. Payments are made through direct deposit or paypal once per month. This position requires 10-25 hours per week with the option to work up to 40 hours per week based on job performance. Schedules are flexible. What are the requirements to work for iSoftStone? Does iSoftStone hire you as an employee or an independent contractor? The job listing is an independent contractor position which makes you responsible for managing your own taxes. If your earnings succeed over $600 within the calendar year, you will be required to complete a 1099 form. Typically iSoftStone does not advertise this work at home position on their site. Usually you will find the job listing advertised on Indeed or Craigslist. Go here to start the application process. Once you have submitted your resume, you will receive an email with an assessment evaluating your internet skills. You may be asked to evaluate various websites or landing pages. If you pass your first assessment, a second email will be sent to you to further evaluate your skills. If everything goes well, you will be ready to start the self-pace training. What other companies hire search engine evaluators? If you really enjoy searching the web, read this post – 11 Fun Ways To Get Paid Online for Searching The Web. The post will cover 11 simple ways to earn money for doing what you love. how long does it take to hear back from isoftstone? Hi Rebecca! It really depends on if they are hiring at this time. I have seen some companies take months to contact you back. How long ago did you apply? Is it possible to work for similar companies while working for iSoftStone? Is this allowed? Hi Angela! You should check with iSoftstone to see if that’s allowed. I know for sure Leapforce and Lionbridge will now allow you to work for both since it’s a conflict of interest. Yes you can work with iSoftstone, which because it is a Chinese company, does not create a conflict of interest when working with one of the other companies like Leapforce or Lionbridge.